Do you have a question or concern that you would like to see addressed? E-mail us at info@GriffithExp.com and we’ll respond as soon as possible. We provide and prepare all the meals. Our guides are great cooks. They do all of the work of preparing high quality, healthy meals made with fresh ingredients. 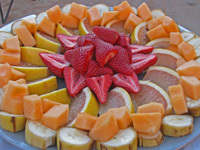 There is a variety of fruits and vegetables, and meat and non-meat choices. The evening meals are grilled and baked to perfection. We accommodate a variety of diets and will assist with dietary restrictions as well. Certainly! We have a tremendous supply of water – the river! The water temperature varies on the time of year but it’s always refreshing. We suggest that you bring biodegradable soap. Guides will help you select a private spot for your personal wash-up. Some guests bring a solar shower for warmer water. What kind of people take river trips? People who want to play outdoors! People who want to enjoy the outdoors without all the pre-planning, buying gear, figuring it out, and having to work at getting comfortable in nature. Our guests come from a broad spectrum of backgrounds, careers, ages and experiences. Ages vary from 4 years to 84 years old. Experience ranges from never camped before to grew up in the wilderness. Comfortable clothes that can get wet. Swimsuits, quick drying shorts and T-shirts. Bring long pants and long-sleeve shirts if you need protection from the sun. Old clothes are best, the kind that you don’t care if they stain (because they will) or tear on a hike. You’ll want shoes that can get wet, teva-type sandals that are secure on your feet are good. We’ll send a complete packing list that details everything you’ll need. We also have a store in our Moab river complex where you can buy t-shirts, sunglass holders, waterproof cameras and suntan lotion. Our camps are typically on sandy beaches along the riverbank where you roll-out sleeping bags, pitch a tent if you wish or sleep under the stars. Experienced guides help you make your camp for the night and will teach the less experienced guest how to be comfortable in the outdoors. We host many people each year who spend their first night outdoors with us. We provide top quality tents and sleeping kits an all of our expeditions. Let’s start with snakes! We rarely see snakes on our trips because there aren’t many of them. The few there are usually stay high in the rocks and away from our campsites. They don’t like us! 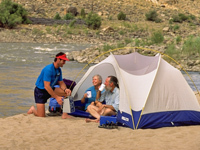 Insects are of little concern on the river, but a little bug repellant is a good idea. Spring on the Green River does have mosquitoes and a few no-see-ems here and there. There’s a bug or two on the ground but we’ll teach you how to stay away from them. The toilet on the river is not much different than what you have at home, except the view is much better. We bring a portable toilet that is set up in a private location in camp and then packed up the next morning and secured on the rafts. During the day it is provided as needed. There is a portable facility for washing hands with soap and water. We do ask that you pee in the river or on teh wet sand next to the river and reserve the toilet for other things. If you frequently get up in the night, please feel free to ask your guide for a "pee bucket", which can be set up near your gent each night. Our Colorado River-Moab Daily and Family-Only Colorado River trips are great for families with younger children (ages 3 and older). 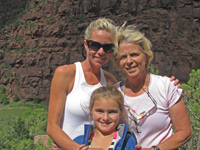 Our Family Trips on the Green River are appropriate for families with children ages 5 and older, and our Gates of Lodore trips on the Green River are fun for all who are age 8 or older. Our trips on the Yampa River and on the Colorado River through Westwater and Cataract Canyons are great for anyone ages 10 and older, though highwater Cataract Canyon Trips may have an age restriction of 12 and older. On the upper end of the age spectrum, as long as you are in good health and are relatively mobile, you should be fine on any of our rafting trips. Most of the hikes require moderate physical exertion, but all are optional. If the water levels are significanty abnormal in any given year, we may contact you if we feel that your vacation could be adversly affected with other possible rafting options. We have a strict NO CANCELLATION policy. We strongly suggest the purchase of travel insurance to protect your vacation investment. Please feel free to contact us with any questions or concerns. What happens if not enough people sign up for my trip? We do have minimum reservation requirements on our rafting trips. If we do not have enough reservations for a trip to be economically feasible for us to operate, we will contact you within 45 days of your departure. At that time you will have the option of moving to another trip, waiting to see if others join the trip at a later date or cancelling your reservation with a full refund. We understand that your vacation is important, and we strive to make your vacation as easy and memorable as possible. If we cannot operate the trip that you have signed up for, we will work to find an alternate option that you are happy with. I am a solo traveler, is that OK? Of course! Our guides are excellent at creating and maintaining exceptional group dynamics. They help everyone feel like part of the group and make sure that noone is left out or uncomfortable. There are a few different options. The closest commercial airport is Walker Field in Grand Junction, Colorado, which is about 2 hours away from Moab. Another option is Salt Lake International airport in Salt Lake City, Utah, which is about 4 hours away from Moab. You can also fly directly into Canyonlands Field Aiport near Moab with Sky West Airlines from Salt Lake City, Utah. There are shuttle services available in both Salt Lake and Grand Junction. 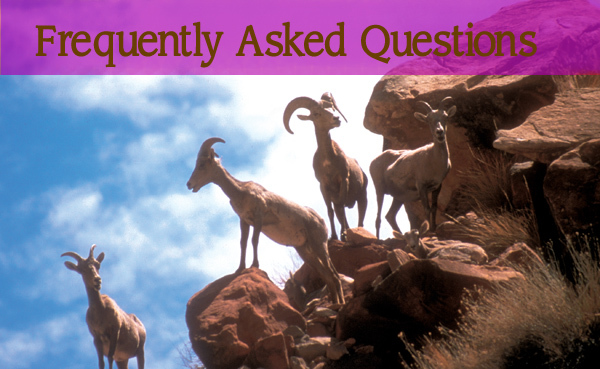 We suggest renting a vehicle that you will be able to use to see Arches and Canyonlands National Parks or for other activities in the Moab area. Yes! We love to help our guests celebrate special occasions. Whether on the river or when giving the river trip as a gift, we are happy to help you celebrate in style. Please ask our Guest Services staff for ideas of what we can do for you.